I planned to post this a week ago and I was simply a bit lazy. As a big thank you to my hanai family, I made Christmas eve dinner. We had visitors from Michigan and our sister #3 came in from San Diego. They were meat eater. I wanted to do something different. With our unseasonally warm winter, I was able to grill outside. 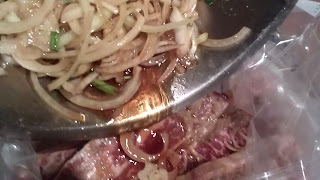 I decided to have an Island style dinner and the star of the evening - Korean Kalbi. My first boss was Korean. She taught me a lot when I started out in a French coutour shop in New York. She was my first business mentor and she also introduced me to Korean cooking. When I entered the "real working world", I used to meet her every Wednesday evening at a little Korean place in Korean town on 30th street to talk over my week. With my moves through the years, we lost touch. I thought of her often, wondering where she is now. 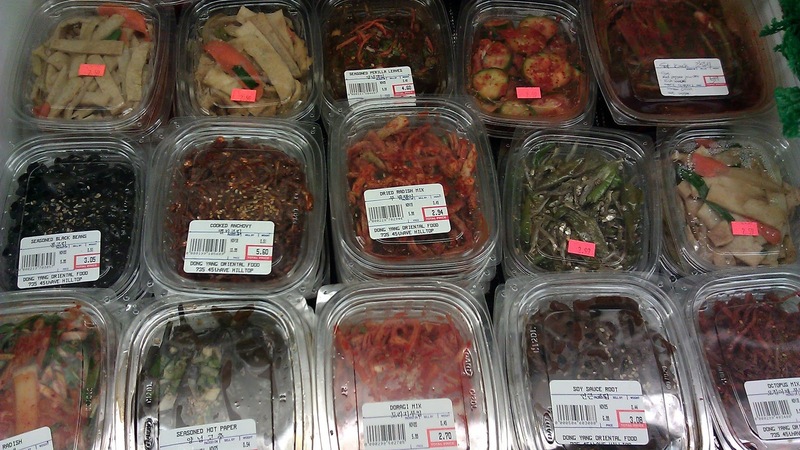 Every time I made Korean food, I thought of her. This is a recipe from her. Thanks Dawn. Korean ribs are usually cooked table side. I have a the grill top and stove for the whole experience, however it would get the house a bit smoky. 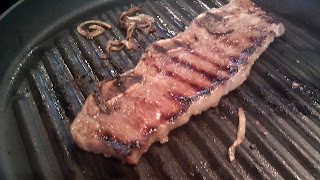 I prefer to grill the meat outside or in a grill pan on the stove. 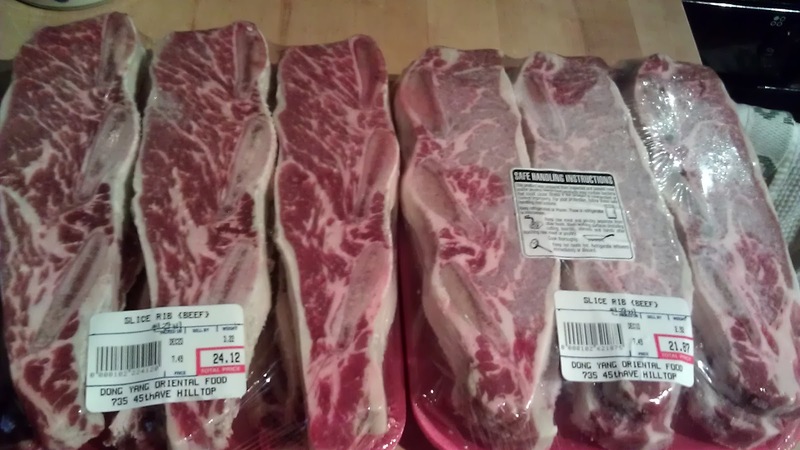 I tested this batch on a grill pan and cooked the rest outside. The recipe is for a single batch. I made a double here. 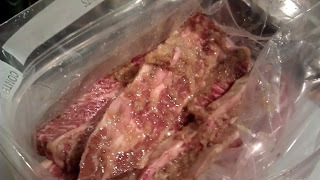 The ribs also freeze very well. 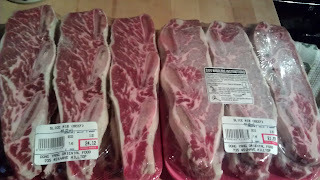 3 lbs beef sliced short ribs. 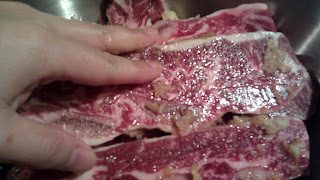 Try to get the ribs from a Korean grocer, trimmed and sliced perfectly for grilling, not too thick and not too thin, about 1/4"
2 tbsp chopped garlic, about 4 cloves. 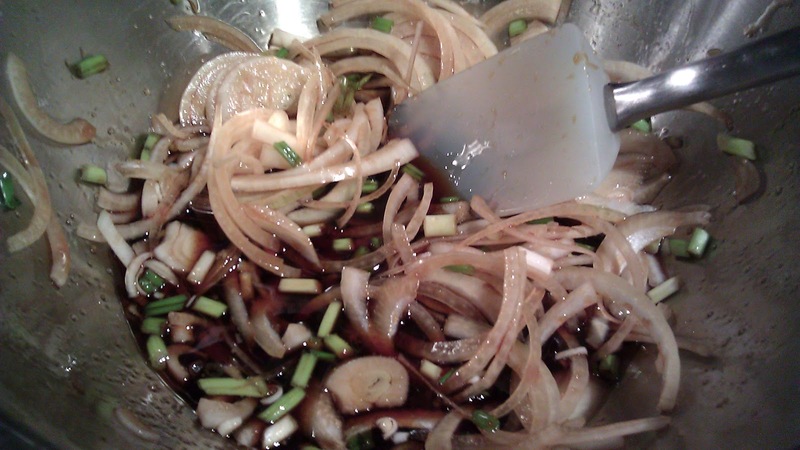 Pour marinade into the meat. 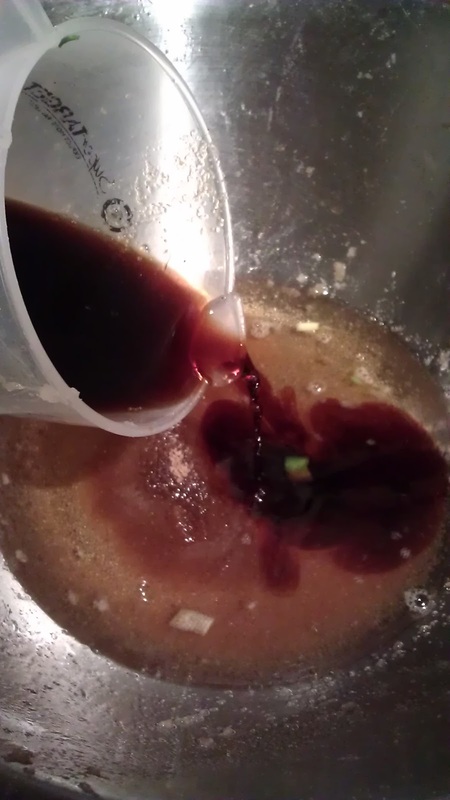 Close the bag and mix well. Let the meat marinade overnight in the fridge. 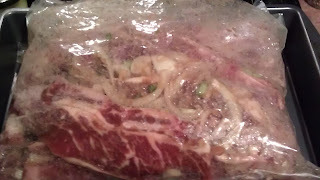 Turn the meat a couple of times. 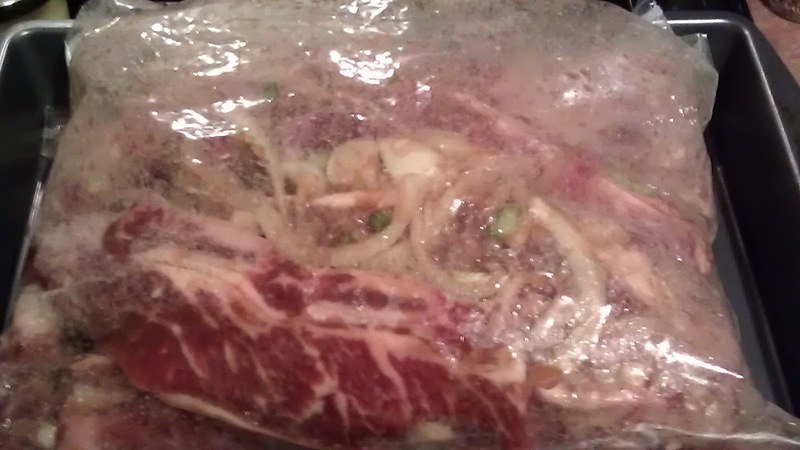 At this point, you can separate the meat into smaller portion and freeze for later used. 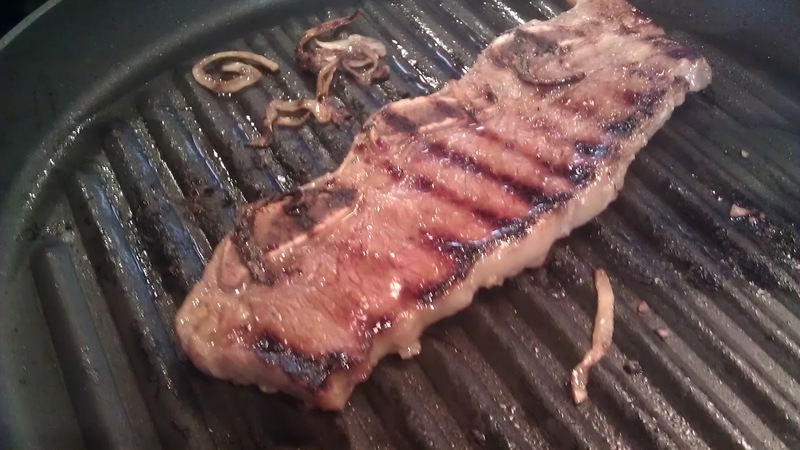 Grill meat to desired doneness. I like it well done. When ready, use the a scissor and cut the meat off the bone and into smaller pieces. 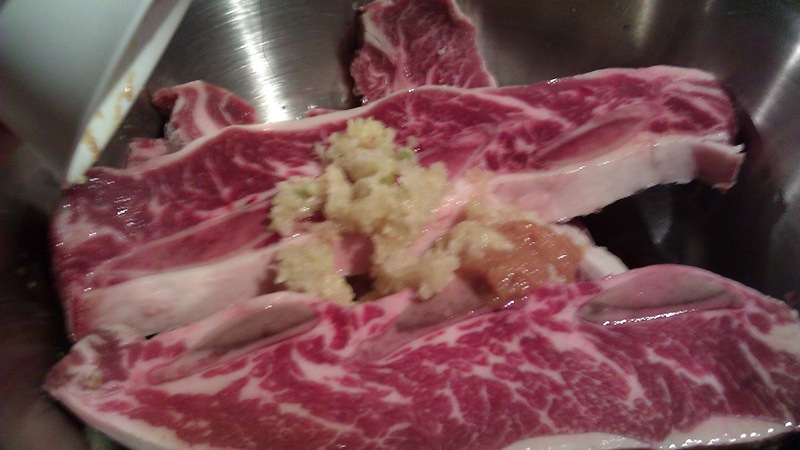 Traditionally, the bone pieces will be returned to the grill and cook till crisped. Many Asian love to have the meat bone with beer. 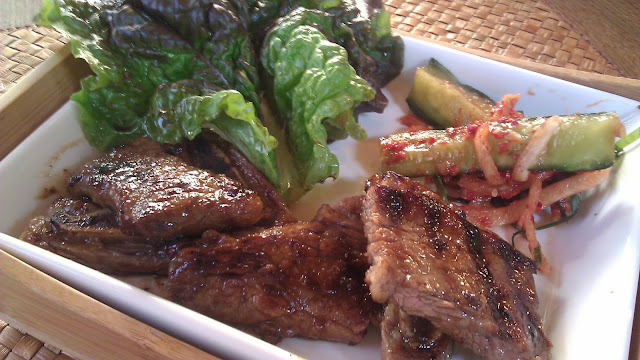 To serve: wrap a piece the meat in a piece of lettuce, you can add a piece of kim chee, grilled garlic piece with the meat. Enjoy as a lettuce wrap. 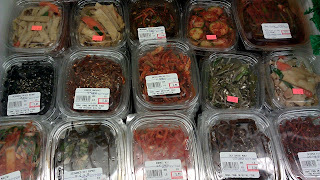 I don't make kim chee, I would pick up a few variety from our local Korean grocer - Dong Yang Oriental Foods. Serve 6 as an entree.